Chris Avellone, a famous RPG developer with his name in the credits of games like Icewind Dale 1 and 2, Star Wars: Knights of the Old Republic 2, Alpha Protocol, Fallout: New Vegas, and Pillars of Eternity, only announced he was working on Arkane Studios’ Prey a few months back. Despite only a short time passing since the announcement, though, it seems he’s moved on already. Keep track of what’s new with our list of upcoming PC games. 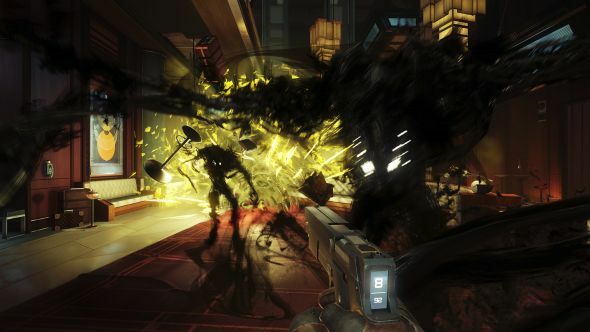 “I’ve been wrapped up with Prey for a while now,” says Avellone in a recent interview with Fallout fan site Sugarbombed. Back when he announced his role on the game in June, we speculated that he might be helping lay the groundwork on the game’s RPG systems. It’s looking likely that this is the case, or perhaps he was lending his writing talents to the project. Either way, he’s moved on now. The interview also sheds some light on how Avellone feels about publishers Bethesda, with whom he’s worked with on both this and Fallout: New Vegas, particularly how he feels about their marketing, which is apt following their recent decision to not send out review copies ahead of release. He goes on to talk about how Hines is quick to get stuck in demoing a game if needed, rather than hanging back and sticking rigidly to a pre-defined role. Beyond that, away from the individuals, Avellone thinks Bethesda’s marketing tactics work because they plan every move. “This is rare in my experience,” he says. “Bethesda is clear about messaging, they time and focus information releases, schedule demo dates properly (ask any developer, but demo deliveries should never be sprung as a surprise to any development team because demos can derail development by months), and more. Also, if there’s any doubts as to how well marketing does their jobs, I’ll just say this – you can buy Fallout t-shirts in Target. Target. I still can’t believe it. It’s a fair point. Fallout has grown from a relatively niche RPG to the sales behemoth it is now. There were 12 million copies of Fallout 4 shipped to retailers just to satisfy pre-orders, and that was with just six months between announcement and release.